Truskmore is the highest mountain in the Dartry Mountains area and the 206th highest in Ireland. 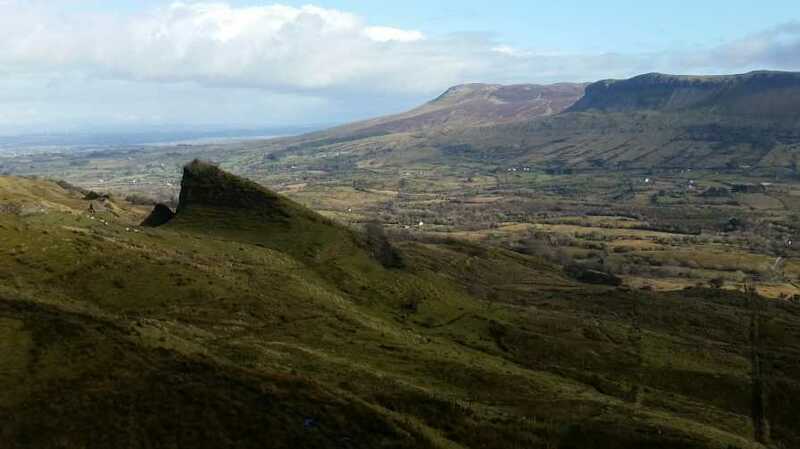 Truskmore is the highest point in county Sligo. I had intended to summit Tievebaun and/or Truskmore, and had also hoped to check out "Eagles rock" using the car park as a start point at IG78210 48924 D, so I proceeded to park my car at this official "Eagles rock" car park. I heard a quickly approaching quad as I was driving in, and after reading all of the reports here about angry farmers and difficulties between walkers and local landowners, I decided right away to stop my car, get out and approach the man with a friendly attitude and introduce myself. The man was a local farmer, and after explaining to him that I was there to do some walking with my partner to enjoy the lovely weather and mountains, he responded in a friendly manner but informed us that the amazing rock formation we were looking at was not, in fact, really eagles rock at all. The information on the car park information board was misleading he said, and that eagles rock is not the impressive structure in the information photo. He pointed out a much smaller rock (see my track for photos here: https://mountainviews.ie/track/3725/ ). The track from the "Eagles rock" car park leads all the way up to this rock. The man advised us that we could park in the carpark and take the path up this this smaller rock without any trouble. He said the neighboring farmer was very contrary, and didn't like people anywhere near his land. We said we might consider continuing on to summit Tievebaun and/or Truskmore from there also, and to this the man advised that it would be fine to do this also and there is a way up. He didn't seem to express any fears about land access, so I'm assuming he owned this part of the land and perhaps was quite friendly towards walkers. We were told that cars had their windows smashed in this carpark, but thankfully I drive an old banger so I wasn't very worried about this. We found the track up to the smaller "eagles rock" was very good, and would be suitable for families. It gets very muddy just before you get to the rock, and you'll need to fence hop a bit to get into the rock itself and climb it. Views are incredible all around.